Do you ever wonder how you’ll share all of the Instagram pictures, Facebook posts and smartphone photos you take of your kids? 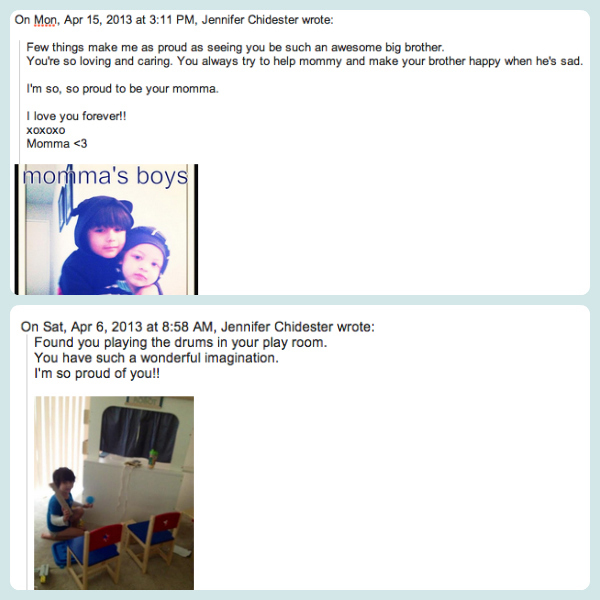 Set up an email account where you can send your kids digital love notes they can read when they’re older. From Gmail accounts to Twitter handles and URLs, many parents secure email and social media accounts — with some version of their child’s name — to try and reserve their digital identity. Whether Gmail, Twitter and the like will be around, or even popular, by the time your kids are old enough to use them is always debatable, but it doesn’t hurt to start somewhere! When I first set out to secure Gmail addresses for both of my sons, their names were already taken. I decided on a combination of their names plus a number that’s significant to our family. Since you’re likely not going to use these accounts as often as your own email, make sure you keep track of log-in information. I make it a point to tell my children how much I love them, what I love about them and all of the ways they make me proud… often. However, at 2 and 5 years old, they’re likely not going to remember the details. By setting up Gmail accounts for both of my boys, I can email digital love notes to them when they do something sweet, say something funny or when I just want to let them know how much I love them. I love the idea that someday my kids will open all of these little love notes on their computers and know exactly how I felt at the time, or that something I might have otherwise forgotten about their childhood was documented for them. Even though I make annual scrapbooks for each boy’s birthday, I still have thousands of photos on my iPhone and on my computer that my kids may never see. In this age of digital photos and obsessively documenting everything we (and our kids) do on our cell phones, the generation after us is likely going to have more photos of their childhood than they’ll ever know what to do with. If you establish an email address for your kids, you can easily snap and share photos with them in real time, straight from your phone. Or, set up sharable albums on a cloud and give them access to the folders via their email accounts. Because my boys are still young, my Facebook timeline posts and Instagram photos on my private profiles will be severely outdated by the time they’re old enough to read — if I even decide to let them have access to social media before a certain age. As an alternative, I love to grab screenshots of Facebook and Instagram posts with them in it, then email them the content so they get to see the photos or videos, what I posted about them and what family members and friends are saying about it. 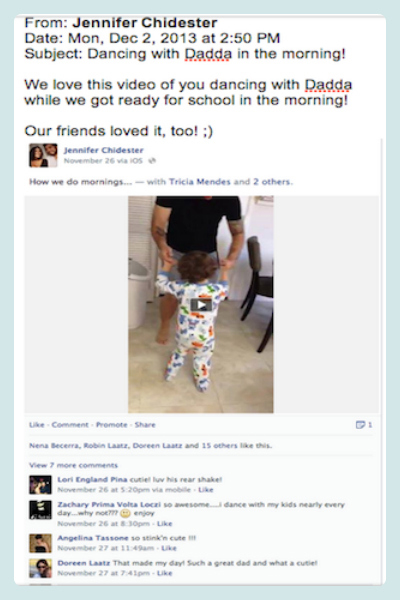 As outdated as MySpace is now for this kind of sharing, when I announced that I was having my first baby to my friends and family on MySpace, I grabbed screenshots of everyone’s reactions and included those in my first son’s baby album. 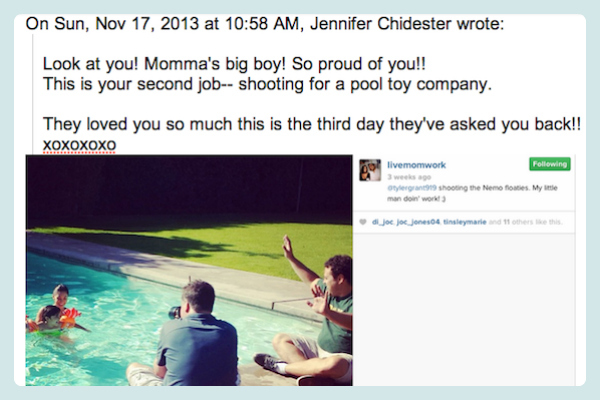 Sending emails with social content is even easier, now, and they’ll probably get a kick out of it when they’re older! Facebook and kids: How young is too young?